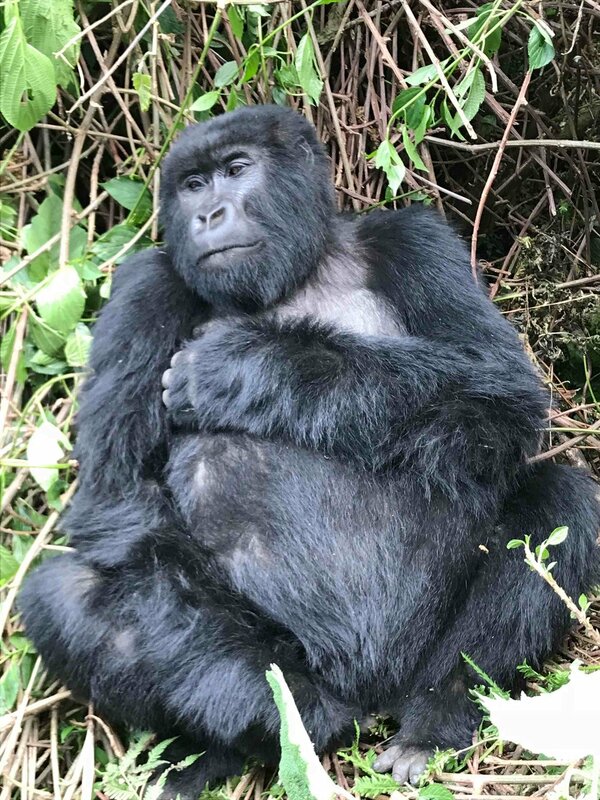 In July 2018, twenty Adventurers (veterinarians + family members) visited Rwanda to track and observe the Mountain Gorillas. The VETS Adventure Travelers flew from across the USA into Kigali- the capital city of Rwanda. From there, we were shuttled (2 1/2 hour drive) by Primate Safaris to the Sabyinyo Silverback Lodge in Volcanoes National Park. The Sabyinyo Silverback Lodge is lovely. The rooms were excellent with comfortable beds and nice bathrooms. Each room had a magnificent view of the Volcanoes National Park. The food was amazing and there were plenty of outstanding African wines to enjoy with dinner. The Sabyinyo Staff was friendly and helpful. The parking lot is at the base of the facility and it was a little bit of an uphill walk to the lodge-- at 9,000 feet-- so those of us not acclimated to the high altitude were quickly winded and appreciated that the Staff would carry our bags and backpacks for us! There are about 170 gorillas in the park. They are social animals that live in groups generally composed of a dominant male and up to five or more females and their young. Each gorilla group is continually foraging for food. Their food consists mainly of leaves, buds, tubers and wild celery. Trackers went out in front of our group to locate the gorillas and our Guides communicated with the Trackers to lead us right to the gorillas. Well, there actually was some hiking through the jungle (~9,000 ft above sea level) before we actually got to see the gorillas! Once we arrived at the gorilla group, we were allowed one hour of 'viewing time. 'In this video, you can see the gorillas tumbling around like a couple of unruly kittens. We had the opportunity to "track and trek" a different group of gorillas on the second day. Every gorilla family is different, just like every human family. Our second group of gorillas has a dominant silverback and a subordinate silverback. Here is the subordinate in deep thought . . . This young 'blackback' gave us some excitement when he jumped out of the brush and chased another juvenile along our path. We always tried to maintain a 7 meter distance from the gorillas, but they didn't always follow that rule! After his game of 'tag' with the other gorilla, he decided to sit down along our trail and strike a pose. 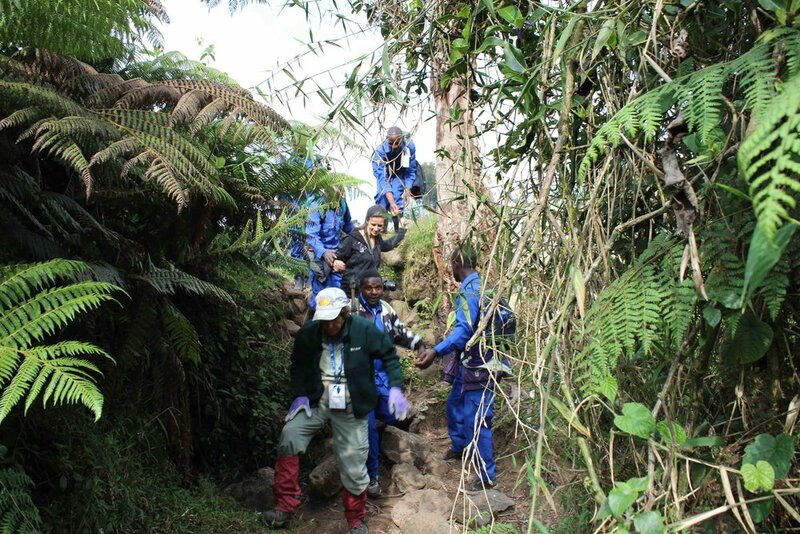 The trek to find the gorillas ranged from about one hour in the jungle up to 3 hours (plus drive time.) Once we found the gorillas, there is a one hour limit on the visitation. 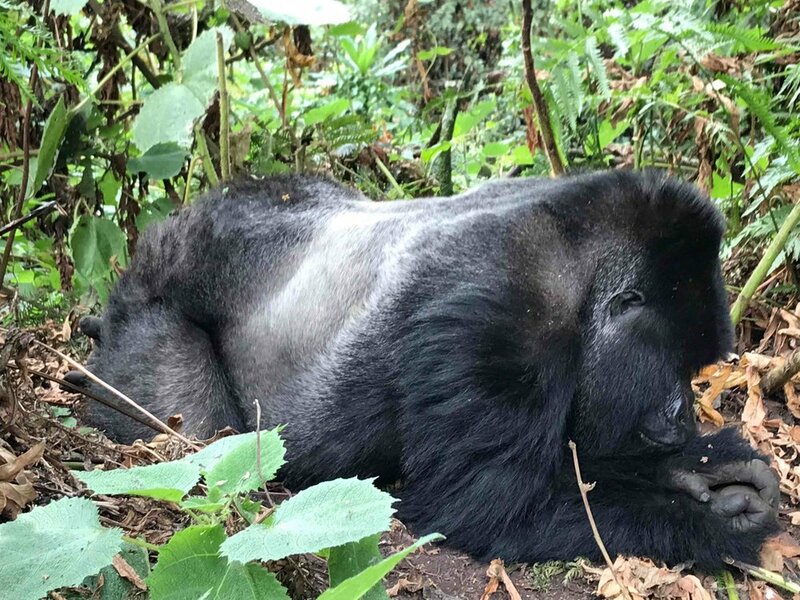 Though we were sorry to see our hour come to an end, we understood that the gorillas had important things like foraging and playing to do and we bid them 'farewell' with smiles on our faces. The VETS Adventurers at the conclusion of our second Gorilla Trek! For more information about the veterinary-related trips and continuing education that we offer, go to eduvets.com!